One image of Mayor Daniel O'Connor (1864–1933, Mayor 1894). Daniel O'Connor was born January 31, 1864 in Pembroke, Ontario to Patrick O'Connor and Elisha Loughrin (brother Town of Sudbury Mayor Larry O'Connor). He married Mary Anne Bourke on May 5, 1891 in Brockville, Ontario. Shortly after, O'Connor moved to Sudbury where he was a mining prospector, lawyer and politician. 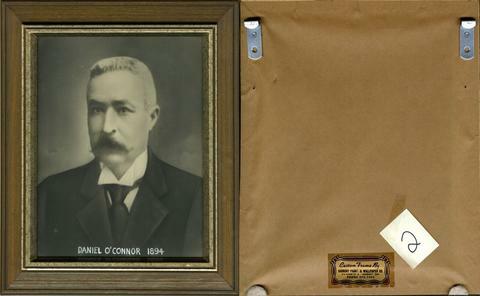 In 1911, O'Connor was a storekeeper in Bond, Ontario and by 1921, O'Connor was a storekeeper in Temiskaming, Ontario. By the early 1930's, O'Connor was a storekeeper for a General Store in Timmins, Ontario where he died of Bronchial Pneumonia on March 30, 1933 at the age of 69. Daniel O'Connor was interred in Sudbury, Ontario.